Genetic differentiation among UEP defined groups of microsatellite-haplotypes is quite high (Rst = 0.59; P<10-3),> We also explored the correspondence between the two types of markers at a geographical level. There is a high and significant correlation observed between pairwise binary-haplogroup-based and microsatellite-haplotype-based distances among nine geographic regions (r = 0.91; P< 10-3). The two-dimensional plots from MDS show similar clusters of populations (Fig. 3), with slight differences possibly due to differential sensitivity of Φst and Rst to different mutational processes. North-western Africa, eastern Africa and the Balkans are well separated from each other and also from the central cluster in both diagrams. The differences are explained to a large extent by: the haplotypes associated with paragroup E-M78* (predominantly observed in north-western Africa), haplogroup E-V32 (found almost exclusively in eastern Africa) and haplogroup E-V13 (the only subset of E-M78 observed in the Balkans). E-V13 is also commonly found in the populations of the central cluster, where, however, other E-M78 sub-haplogroups are also present. Taking into account the above data, the previously described European cluster α and the northern African cluster β are indeed confirmed as monophyletic groups of chromosomes, that, very likely, have their own defining binary marker yet to be discovered. Cluster α chromosomes constitute a major branch of the binary haplogroup V13, which, in turn, includes also a few, highly differentiated chromosomes - previously classified either in cluster δ or unclassified. All 29 chromosomes within cluster β belong to the paragroup E-M78*, which is relatively rare and almost exclusively restricted to a single geographic region (i.e. northern Africa), thus a common origin for at least a large part of these is likely. offer the opportunity to explore in a better defined phylogenetic context the origin and distribution of the chromosomes belonging to haplogroup E-M78. Also, it is worth noting that twelve chromosomes that we were unable to assign to any cluster in the previous network analysis are now classified within four different haplogroups/paragroups (see Table 2 and Fig. 1B) as highly divergent microsatellite haplotypes. Thus, even though they represent only 5% of the total E-M78 chromosomes analyzed, their inclusion into the respective haplogroups/paragroups heavily affects inferences about time and place of origin of these haplogroups/paragroups. 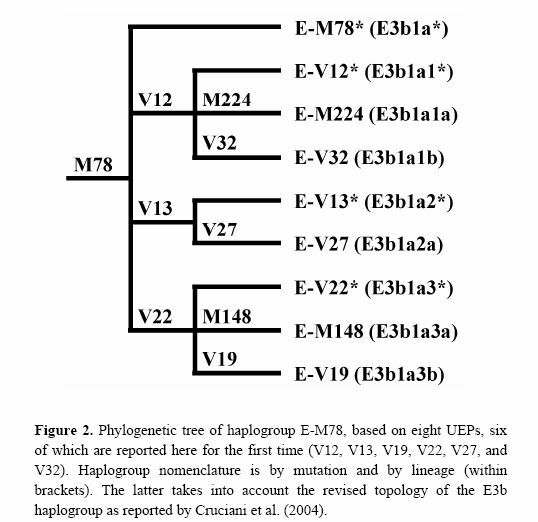 Finally, although there is a strong correspondence between cluster γ − defined by the rare DYS19 11-repeat allele - and haplogroup E-V32, the presence, in cluster γ, of haplotypes belonging to the binary paragroups E M78* and E-V12* can only be explained by admitting either a paraphyletic or a polyphyletic origin for the chromosomes in the cluster. Cruciani F, La Fratta R, Torroni A, Underhill PA, Scozzari R.
The human Y chromosome haplogroup E-M78 (E3b1a) occurs commonly and is distributed in northern and eastern Africa, western Asia, and all of Europe. 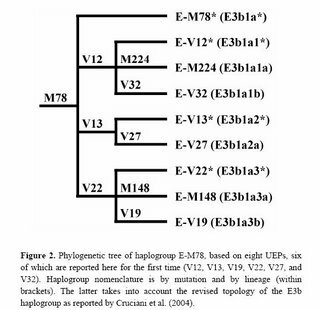 Previously, only two rarely observed internal biallelic markers (UEPs) were known within the E-M78 clade. Here we report the identification of six novel UEPs that significantly refine the phylogeny of this haplogroup. 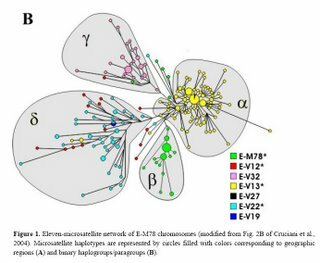 Then, we evaluate the correspondence between the newly defined sub-haplogroups and the E-M78 haplotype clusters previously identified by an 11-microsatellite loci-based network encompassing 232 chromosomes (Cruciani et al., 2004). We observed considerable correspondence between the trees generated by the two types of markers, but also noted important discrepancies between microsatellite and UEP findings. Overall, this analysis reveals that the currently visible terminal branches of the Y tree still contain a large amount of information, in terms of undiscovered biallelic markers, and that caution is needed when using the microsatellite alleles as surrogates of unique event polymorphisms.